The police chief in Pelham, New Hampshire, and his family have suffered a devastating loss after a fire destroyed their home Tuesday night. Now the community is rallying around them. Authorities are investigating what caused a 3-alarm fire that burned through the home of Pelham, New Hampshire's police chief just days before Thanksgiving. Officials say the fire started in the garage around 9:20 p.m. on Tuesday. Pelham Police Chief Joseph Roark said he and his wife, their two young sons, and their dog got out just in time, as the fire spread from the garage to their cars and then into the house. "It went extremely fast. We were having a regular night watching television and that garage was fully engulfed," Roark said. "What I have on is what I have, what my wife has on is what she has." 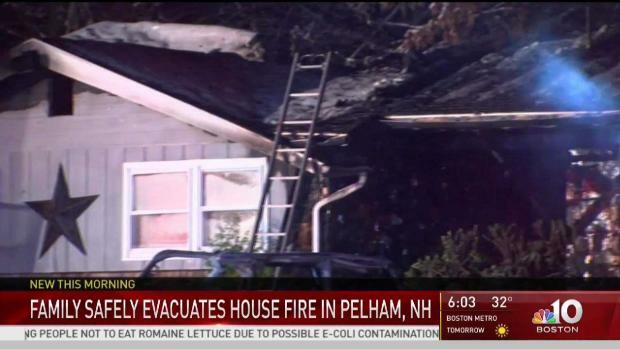 New Hampshire authorities are investigating what caused a 3-alarm fire to burn through the home of the Pelham police chief. More than a dozen fire trucks responded to the home. Officials said the lack of fire hydrants in the area made fighting the fire challenging. The home appeared to have extensive damage, but authorities say no one was injured. "I definitely have never seen anything go up so quickly and you're just helpless because you can't stop that," said Pelham Police Lt. Anne Perriello. "It's not a good time ever, but obviously with the holidays coming it makes it even tougher." Roark said he's used to being on the other side of a tragedy like this. "It's Thanksgiving and we were planning on hosting things and we were planning our lives and the next day we're starting over, so we'll start over, we'll come back stronger," said Roark. Despite losing everything they own, Roark said he still has a lot to be thankful for. 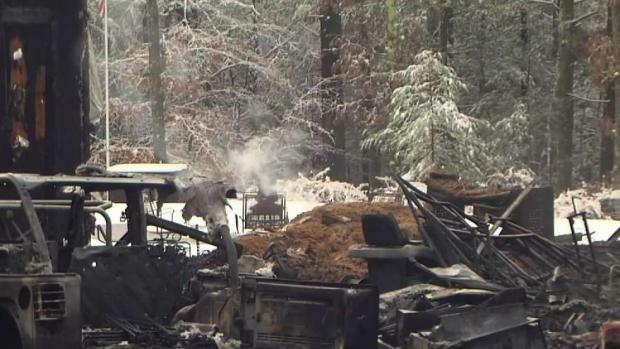 The family of a NH fire chief safely escaped after their home became engulfed in flames. "Just thankful I have my family, we're healthy and we'll recover," Roark said. Thousands of dollars have already been raised for the Roark family and people from the community have been stopping by the police department to drop off donations. "I'm just dropping off a gift card, they don't want anything just yet so when it gets closer, we'll drop off coats and shoes and clothes and stuff for the house or whatever they need," said Noreen Maigatter who knows the Roark family. "It's a testament to our small community how we can kind of rally around the people who help us on a daily basis and when they need help, we can step up and fill the shoes," added Pelham resident Charles Gualtieri. The investigation into the fire is ongoing.